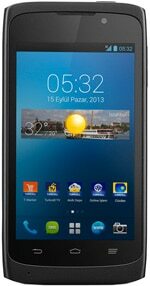 The Turkcell T40 is a “local” NFC smartphone that was designed and is manufactured in Turkey. Launched in September 2013, the T40 runs a tweaked version of Android 4.1 Jelly Bean and is powered by a Qualcomm 8225 1.2GHz dual-core processor. The device’s 4-inch 480×800 display is complemented by rear 5MP and front 0.3MP cameras.